One Republican politician isn't too impressed with the recent, heated debate concerning the Confederate flag, calling it a "manufactured political crisis" meant to distract. 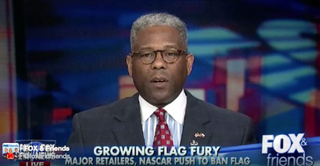 Former Rep. Allen West of Florida quoted Chicago Mayor Rahm Emanuel's statement to "never let a good crisis go to waste" on Fox & Friends Monday morning, adding that the discussion around the Confederate flag was distracting from the problems plaguing the black family and from violence in Chicago. "When you look at what is happening with the failures of the black family and the decimation in the 50 years since the Great Society programs of [President] Lyndon Johnson, we've gone from 77 percent of two-parent households in the black community down to 25 percent," he added. "That's what we should be talking about, not about a piece of cloth."